Product #16041 | SKU 8456 | 0.0 (no ratings yet) Thanks for your rating! The Audio Express from MOTU is a compact, yet fully featured digital audio interface that connects to any current Mac or PC via FireWire or high-speed USB 2.0. The interface is compatible with virtually all DAWs on the market today, but can also function as a standalone mixer, both in the studio and for live events. The unit provides a lot of connectivity for a compact unit. Connect a microphone, guitar, keyboard, and digital input, and the interface is ready to make pro-quality recordings. Quickly balance the levels of the analog and digital inputs, right from the front panel. Each instrument has its own volume control. Route inputs directly to any output pair, each with its own unique mix - main outs, line outs, S/PDIF out, and phones. 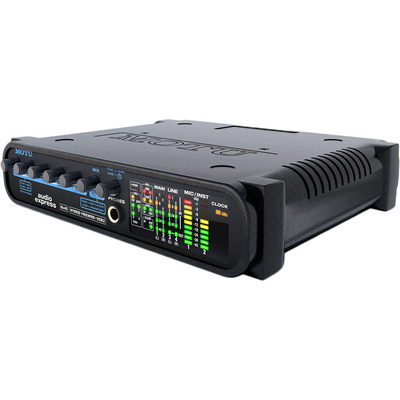 Because immediate volume adjustments are always within reach, the Audio Express serves as the perfect compact, portable live mixer, with or without a computer. Even without a computer, the interface provides complete control over all four mix busses with direct access to volume, mute and solo for each input. So for a live event, one mix can be sent to the main PA while another mix is sent to the personal monitors. On-screen mixing with the included CueMix FX application provides comprehensive graphic control over a mix and other settings in the Audio Express. The application can be operated side by side with any host audio software for Mac or Windows, and it can be controlled from the Mackie Control Universal Pro automated work surface.